I joined yet another Flickr group this year, the Triple-Zip Along with Debbie from A Quilter’s Table. I couldn’t resist using my current favorite fabrics by Joel Dewberry, Notting Hill in Magenta. I wanted the medallion to be featured on the front with the orange band at the top so my pouch is a little larger than most. I think I’d like to make a triple-zip with a square bottom next, maybe a zip on each side as well as the top… If you click on the photo you’ll get a bigger image and will be able to see the little birdie zipper pull which I picked up at Quilt A Bag with my friend Tara yesterday. 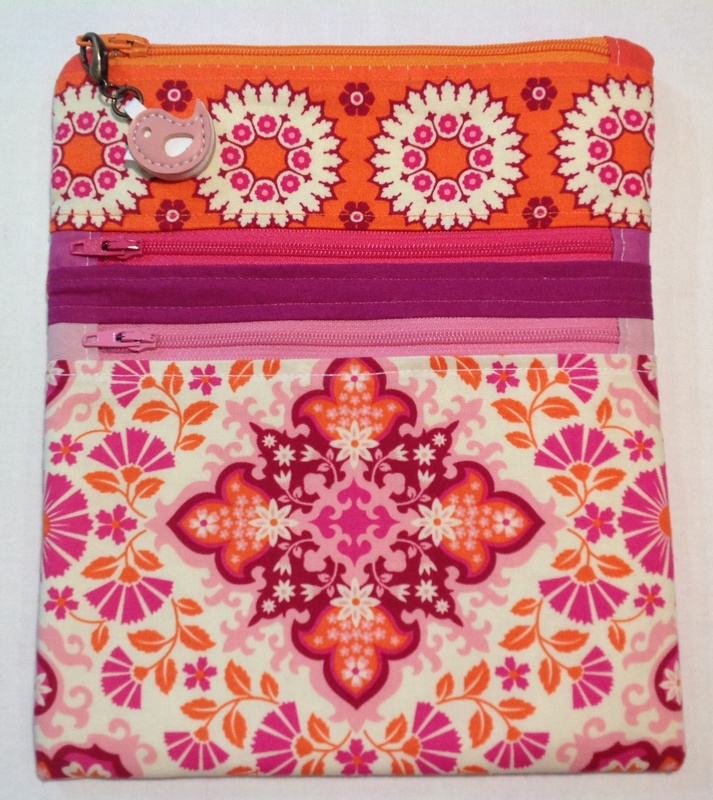 You can check out other Triple-Zip pouches here. What’s your current favorite fabric(s)? This entry was posted in Fabric, Flickr, sew along and tagged A Quilters' Table, Joel Dewberry, Notting Hill Fabric, Triple-Zip pouch by Tabatha. Bookmark the permalink. Sooooo cute, what’s not to love! The little bird pull just sets it off. I think this fabric is so pretty and I’m thrilled that the bird really works with it! Looking forward to seeing what fabrics you choose, welcome to the Triple-Zip Along!! I have serious bird-envy! I’ve been looking for fun zipper pulls (that don’t cost more than all the other ingredients combined) forever. I went to their site, but alas, no zipper pulls. You scored. The bag is adorable. I was sooo luck to have found that birdie, it was a fluke really and the nice thing about it is that is’t small and LEATHER!! Your pouch is great – love that you customized it to serve your need! Hope you made another along with the Triple-Zip Along! I have some projects to finish up but yes, I’d like to make another, I’m always looking to improve my skills! I absolutely love your pouch! Great fabric and that zipper pull is adorable!! Cute pouch. I am planning on doing that pouch as well. Looking forward to seeing your Triple-Zip Pouch in the Flickr group!